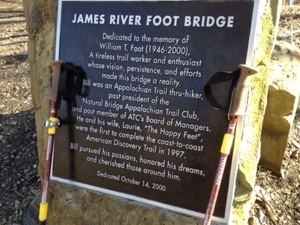 Punchbowl Shelter, Va., AT NOBO mile 791.3, Monday March 24, 2014 — My name is James and so is the river. The James River of Virginia. Yes, that James River. Jamestown, Pocahontas, and all that. Well, I crossed it early this bright pleasant morning. 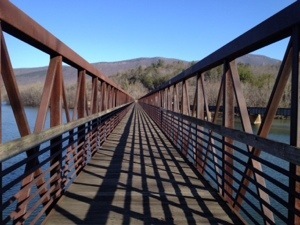 The bridge is a special one built for hikers in 2000. Otherwise we’d either swim as in Maine or share one with traffic as in crossing the Hudson in New York. I can wait to take that photo. 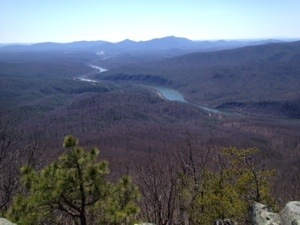 After the walkover, two very steep climbs led to breathtaking views of the James River valley. My leg muscles were less than 100 percent after yesterday’s 22-mile lactic acid bath. So, I took my time having only 13 miles on today’s flight plan. The top of the second climb is Bluff Mountain where a fire tower once stood. 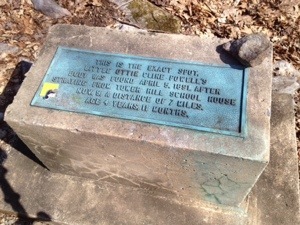 Just next to its foundation is a memorial where Ottie Cline Powell’s tiny body was found in 1894 after wondering away from school at the age of four years and 11 months. Sad. Tomorrow is the Bluedogart Cafe and hostel. Freezing rain is docketed to ensue around 4 am. It’s an 11 mile hike. Should be in town around 2 o’clock. It’ll be the trifecta: Shower! Laundry! Food!